Get the SCOOP on Disney! 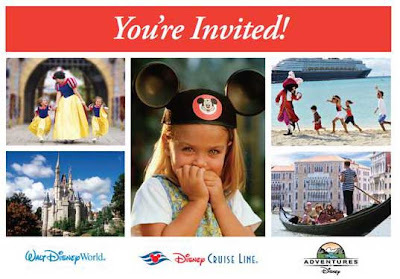 Disney Cruise and Fun-Filled Destination! Why? Because we like you ! A powerful Magnitude 8.8 Earthquake hit offshore Maule, Chile early Saturday morning damaging buildings, bridges, and vehicles while causing severe injury and death in its path. President-elect Sebastian Pinera said more than 120 people died, but that number was rising quickly. A series of after shocks continues to strike the continent of South America. The quake shook buildings in Argentina's capital of Buenos Aires, and was felt as far away as Sao Paulo in Brazil — 1,800 miles (2,900 kilometers) to the east. Charities and governments of the world have mobilized to provide humanitarian aide to Chile. Our thoughts and prayers go out to the people impacted by this tragedy. As the tsunami waves, generated by the Chile earthquake, reached the shores of Japan and Russia there was a sigh of relief across the globe. The waves were smaller than expected causing minimal flooding in most cases. 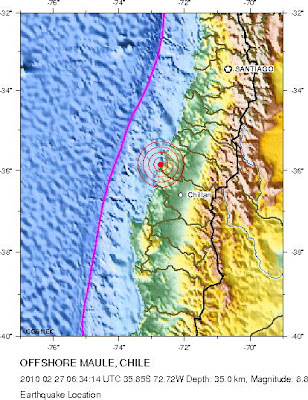 A tsunami has been generated as a result of the quake in Chile. The tsunami could cause damage along coastlines of all islands in the state of Hawaii. Urgent action should be taken to protect lives and property. Tsunami warning sirens awakened residents and tourists in Hawaii, Polynesia, and Tonga this morning. We received a report from friends in Maui that the first waves aren't expected until around 11 AM HST (4 PM EST), so they have plenty of time to head for higher ground. Stores were crowded early this morning as residents gathered emergency supplies. Hawaii could face its largest waves since 1964 according to Charles McCreery, director of the Pacific Tsunami Warning Center. Officials evacuated people and boats near the water and closed shore-side Hilo International Airport at 6 A.M. today in conjunction with preparations for the arrival of a possible tsunami. Anyone with flights booked to Hilo are advised to contact their airline. Other state airports remain open at this time and flight operations have not been impacted. The first wave was expected to hit the French Polynesian Gambier islands at 1550 GMT, then Tahiti at 1750 GMT and Bora Bora at 1815 GMT, the French Polynesia High Commissioner said in a statement. "Danger will persist for at least two hours after the first wave hits and magnitudes could be rising," the statement said. Residents were asked to move away from the shores and seek high ground, it added. Estimated Times for Arrival for North American Pacific coast can be viewed by clicking here. Issued by the Joint Australian Tsunami Warning Centre (JATWC) at 6:50 AM EDT on Sunday 28 February 2010. Maps showing the affected areas are on the Bureau web site. We will provide continuing coverage of the tsunami danger to land and cruise ships in its path. This tsunami has the potential of threatening every nation around the Pacific Ocean — roughly a quarter of the globe. There is a lot of detailed information on each of the Tsunami Warning Center websites so be sure to check out the various links for up to the minute information for your area of interest. 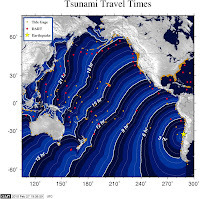 DART® real-time tsunami monitoring systems, developed by PMEL, are positioned at strategic locations throughout the ocean and play a critical role in tsunami forecasting. Interactive tracking map See where ships are relative to tropical storms. The four Holland America Line ships that are operating in the Pacific Ocean at this time were not impacted. The ms Veendam was in protected waters in Chile when the earthquake occurred while the ms Zaandam and ms Maasdam are in open ocean and will remain there until the risk of the tsunami wave has passed. ms Rotterdam is safely docked in Puerto Caldera. We will continue to closely monitor the situation and make adjustments to itineraries if needed. At Holland America Line, the safety and security of our guests and crew is our top priority. We are aware of various tsunami warnings as a result of the magnitude 8.8 earthquake in Chile this morning. Any potential impact to our fleet has been reviewed thoroughly. As a result, some changes to port calls today and tomorrow have been made to ensure the safety of our passengers and crew. Passengers are being kept updated onboard. The Port of Auckland was closed today and five ships were ordered to move into deep water until the threat of a tsunami passed. Dawn Princess arrived earlier and many passengers had already gone ashore when it was ordered out to sea. Don't worry, it will be back to collect the passengers in time to continue to their next port of call. Because of a tsunami warning, the Port of Honolulu has been closed. Pride of America which was scheduled to dock in Honolulu this morning will spend the day at sea until the port reopens. The safety of the ship's passengers and crew is of the utmost importance. While at sea, this situation does not in any way compromise the safety and security of our passengers and crew. At this time, we anticipate that the port will re-open at 5 pm local time in Hawaii. Pride of America should be alongside shortly after that and we expect that the next cruise will depart later this evening. Guests traveling to Honolulu or already in Honolulu for the ship's next voyage should call Norwegian Cruise Line at 800-327-7030. Norwegian Sun is in Montevideo, Uruguay today as scheduled. The ship will arrive in Buenos Aires, Brazil tomorrow as scheduled and embark guests on the February 28, 2010 cruise. We are closely monitoring the situation in Chile and will keep guests updated as to any changes to the current scheduled itinerary. 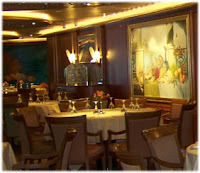 Celebrity Infinity - 14-Night South America, Buenos Aires to Valparaiso is scheduled to depart February 28, 2010. As of this writing it Celebrity has not modified the itinerary. We will continue to monitor the situation and provide updates. Here are some additional weather links which may be helpful. My thanks to the various Tsunami Warning Centers (above) which were my source for diagrams used in this post. This information has been provided in the interest of public education and awareness of the impending danger. Please stay safe - stay away from the water when the tsunami approaches. Do you remember my post, Now is the Time, from last December? In that post, I told you that in a meeting that I had with cruise line executives, they foretold of increasing prices. Ladies and Gentlemen ... That Day Is HERE. For those not familiar with the term "Wave Season", this is the most important time for the cruise line industry during the year. It runs from mid-January through early Spring and besides being the most important time, it is also the busiest time. Carnival Cruise Line announced yesterday that they have seen record bookings for the current Wave Season and as a result of the strong reservation activity for 2010 departures, have announced a general price increase that will become effective March 22nd. Carnival President and CEO Gerry Cahill said, "We're seeing significantly increased volume as consumers are taking advantage of the incredible value that a Carnival cruise provides. And while pricing hasn't fully recovered to 2008 levels, we are increasing prices and will implement an across-the-board increase effective March 22." He said that the price increases will vary by departure date but will be up to 5 percent. Cahill attributed the record booking activity to a wide range of factors, including strong travel agent partner support, targeted marketing initiatives, itinerary enhancements and the wide variety of close-to-home departure points. Carnival Cruise Lines is the largest and most popular cruise line in the world, with 22 "Fun Ships" operating voyages ranging from three to 15 days in length to The Bahamas, Caribbean, Mexican Riviera, Alaska, Hawaii, Panama Canal, Canada, New England and Europe. Carnival also has two new ships on order -- the 130,000-ton Carnival Magic, which is scheduled for delivery in 2011, and a sister ship set to debut in 2012. So, just as I predicted last December, this is only the first of many such announcements which I've been expecting. If you have plans to take a summer vacation with your family this year, I strongly encourage you to book now. We are here to help you. As Cruise Specialists, we are experts in finding the right cruise to meet your requirements. Even with price increases, a cruise is still the best travel value out there. Currently we are featuring Up to a 2-Category Upgrade on Carnival. Find More Carnival Cruises Here. There is no better time to sail on Azamara Club Cruises to Europe. These special rewards are available on all 2010 Europe voyages for Club Oceanview Stateroom bookings and above. 2-for-1 offer: applies to voyages departing 25-Apr-10 through 30-Apr-11 made by 31-Dec-10. Quoted prices on Sailings for Azamara Club Cruises reflect 2-for-1 savings. Savings based on brochure pricing as found on azamaraclubcruises.com/rates. 2-for-1 savings is available on select categories and is subject to change. Onboard Credit (OBC) offer is valid for new individual bookings made by 31-Mar-10 and excludes interior staterooms. OBC is in U.S. Dollars; per stateroom; has no cash value; is not redeemable for cash; is not transferable; cannot be combined with other onboard credits on the same reservation; and will expire at 10 pm on the last evening of the guests' voyage. Guests purchasing single occupancy rates will receive the full suite/stateroom rate. No consumer redemption form required. No action required by agent. OBC will be applied by Azamara Club Cruises to applicable bookings within 15 days of booking. Free Veranda Upgrade offer: Offer is valid for bookings made through 31-Mar-10. Additional Terms & Conditions apply - contact your Cruise Specialist for complete details. Bookings made by February 28, 2010 March 31, 2010 will enjoy current rates. Beginning March 1, 2010 rates will increase depending on availability. AND One Passport to Savings Onboard Value Booklet! You are in the middle of the ocean on a cruise ship and all of a sudden you get a craving for a juicy hamburger and a milk shake. What do you do? 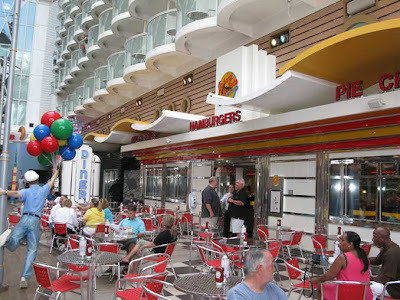 Hopefully you are on a Royal Caribbean ship that has a Johnny Rockets Hamburger restaurant onboard, such as on the Oasis of the Seas. A burger, fries, and shake does sound really good, doesn't it. We thought it might, so for a limited time only we are offering a unique dining experience onboard select Royal Caribbean Cruises. If you've not tried a specialty restaurant before, this is a great way to experience one. For ships that do not have specialty dining and/or Johnny Rockets, a bottle of wine will be substituted. Limit one dining experience in Johnny Rockets, one specialty dining experience, and one booklet per booking. New reservations only, excluding group bookings. Additional restrictions apply. For complete Terms & conditions of this offer, call or email me. Book an Oceanview or above by February 28, 2010 and get dollars off! departing between April 1 - December 31, 2010! What's your favorite indulgence when on a cruise vacation? 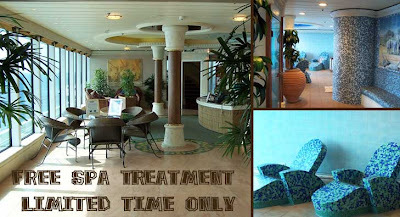 For me, it's one or more spa treatments on sea days. My favorite is actually hot stones, but there are other treatments that are just as fabulous. For just a few more days, we are offering an exclusive offer which includes a FREE Spa Treatment* for one lucky passenger in each cabin sailing in Oceanview or above cabins on ANY 5-night or longer Royal Caribbean sailing. Bookings applicable to receive spa offer will choose among one of three of the spa treatments: La Thérapie Hydrolift Facial; Swedish Massage; Reflexology including Massage. Find More Royal Caribbean Cruises Here. My first massage was on a ship about ten years ago. I've been having regular massages since that time. Massages are good for relaxation and health. Book by February 28th to take advantage of this limited-time offer. Special Holiday Sailing (12/18/11) 6-day Mexican Riviera to Puerto Vallarta and Cabo San Lucas. Special Holiday Sailing (12/24/11) 8-day Mexican Riviera to Puerto Vallarta, Mazatlan, La Paz and Cabo San Lucas. 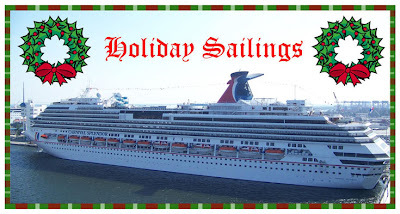 Special Holiday Sailing (12/18/11) 8-day Southern Caribbean from San Juan to St. Thomas, Dominica, Barbados, St. Lucia, St. Kitts and St. Maarten. Special Holiday Sailing (12/26/11) 6-day Southern Caribbean from San Juan to Barbados, St. Lucia, St. Maarten and St. Thomas. Special Holiday Sailing (12/21/11) 7-day Southern Caribbean from Barbados to St. Lucia, St. Kitts, St. Maarten and San Juan. Special Holiday Sailing (12/28/11) 7-day Southern Caribbean from Barbados to St. Lucia, St. Maarten, St. Thomas, San Juan, St. Thomas (again) and Dominica. Holiday Sailings remain some of the most popular cruises of the entire year. Pricing and cabin availability are best when booked well in advance. Every year I have disappointed families that aren't able to find cabins of their choosing because they simply waited too long to make their reservations. Don't even think about getting a last minute "deal" - it just won't be there. With Carnival's Early Saver program, you can enjoy Price Protection (click below for details). 7-day Southern Caribbean from San Juan, 5/01/11-4/29/12. 7-day Southern Caribbean from Barbados, 4/27/11-4/25/12. More time at Denali, more flexibility and a great value! Princess Cruises' new Alaska A la Carte cruisetours allow guests to customize their vacation any way they please. These 10- to 12-night options include at least three days at Denali which is definitely the highlight of any land tour in Alaska. Standard cruisetours include some activities, while A la Carte tours offer more free time at Denali — at least one extra day. The choice is yours - standard cruisetour or custom designed to fit your needs. For a limited time, Denali is on sale. I've had some disappointed guests already - they waited too long and their first choice was sold out. Contact me today to learn more about a Princess Alaska cruise vacation. Princess Cruises revives a nostalgic cruising tradition with the new Bon Voyage Experience, allowing family and friends to come aboard and wish passengers a wonderful trip before they sail! As a Princess Commodore, I've received advanced information about an exciting new program starting this spring aboard many of Princess Cruise Ships. 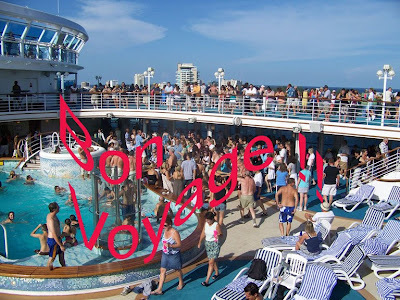 If you are a long-time cruiser, you may recall the bon voyage experience when family and friends joined you onbaord for a send-off on your cruise journey. Reviving a signature tradition from the early days of cruising, the Bon Voyage Experience is an innovative new program giving passengers the opportunity to invite their friends and family aboard their ship on embarkation day to share the fun and excitement of sail-away day. The program allows booked passengers four hours to show off their stateroom and other signature Princess innovations. For just $39 USD per person, participants will enjoy priority embarkation, a guided ship tour, a souvenir photo, and a delectable four-course lunch (wine included) in one of the ship’s beautiful main dining rooms. In addition, each participant will receive a $39 Future Cruise Credit (FCC) to be used on a Princess booking made within 3 months of the Bon Voyage Experience. To ensure that guests are able to get the most of their visit onboard, program participants will be allowed priority embarkation. If participants are friends or family of booked passengers, this benefit will be extended to their sailing friends so they can enjoy the day’s festivities together. Depending on the ship and itinerary, participants should be able to enjoy up to 4 hours onboard (until approximately 3:00 pm on most itineraries). When making a reservation, exact times for embarkation and disembarkation will be shared. During the Alaska season, Sapphire Princess, Golden Princess and Royal Princess will also offer the program from Seattle, beginning in May. and wish you a wonderful trip before you sail! I am happy to see the return of an old tradition. Cruising was meant to be a special vacation, originally afforded only to the "well to do". Thankfully it is now an experience that can be enjoyed by most people. The return of this old tradition allows an opportunity for friends and family to briefly experience life onboard a cruise ship, and perhaps take away some of the mystery about what it's like to take a cruise vacation. 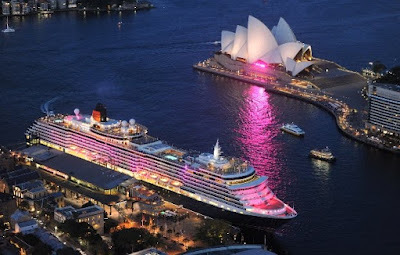 Cunard Line's Queen Victoria, illuminated in pink while berthed at Sydney’s Circular Quay, made history today. Queen Victoria was bathed in vibrant pink light from dusk to support Australia’s National Breast Cancer Foundation (NBCF), which officially launched its 2010 fundraising target of $17 million at an event onboard. Pink lights illuminated the entire ship, providing the ideal setting for the event. “Pink has become synonymous with the fight against breast cancer, so we are delighted to offer NBCF the opportunity to boost awareness of research and claim a world first by being the first to illuminate a liner in pink,” said Peter Shanks, president of Cunard Line. It is not surprising that Cunard Line was a part of this NBCF kickoff event. Parent company, Carnival Corporation, has been a long-time supporter of Breast Cancer fund-raising. Their On Deck for the Cure program benefits the Susan G. Komen for the Cure foundation. Additional history making events are planned for Queen Victoria. Early next year she sails her first "Americas" season, traversing the Panama Canal on more than one voyage, making rare roundtrip sailings from Los Angeles to Hawaii, plus debuting her maiden Mexico Getaway voyage. For more information about Queen Victoria sailings, click here. Norwegian Cruise Line continues their Year of the Freestyle Vacation celebration with the next of the Special Bonus offers. The current offer highlights their Hawaii Cruises. 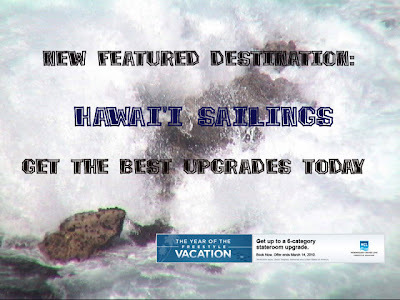 Free upgrades available on Hawaii sailings. Sailings starting from $115/Day. Find Your Cruise. More than 2000 miles from the nearest major land mass, the Hawaiian Islands form the most isolated group of islands in the world. Palm-fringed beaches, tropical sunsets, Polynesian luau's, glowing volcanoes . . . there's something for everyone in Hawaii. .
Hawaiian cruises are the ultimate "island-hopping" adventures, affordably taking you from one tropical Hawaiian Island to another while experiencing the luxurious features of your cruise ship. The Pride of America is your transportation to Paradise. Begin and end your cruise in Honolulu, the capital city of Hawaii. Most cruises overnight in Maui and Kauai with stops in Hilo and Kona. Plan to spend extra time if you can before or after your cruise so that you can visit the sites of Honolulu including the Arizona Memorial. Select Hawaii or one of Norwegian Cruise Line's other destinations and do whatever you want whenever you want on a Freestyle Vacation. As the 2010 Winter Olympics begins in Vancouver, all eyes are on this city in British Columbia, Canada. The athletes of the world descend upon this city bringing years of preparation, their skills, and a lot of determination to do the very best they can to represent their home countries. The city of Vancouver has also prepared to put on a spectacular display for the world. Vancouver is nestled between the mountains and the ocean with plenty of attractions and activities to keep locals and visitors busy. During the Olympics, additional events are planned including many free events. Some of these events will continue after the Olympic torches are extinguished. 2010 is the perfect time to visit Vancouver even after the Olympics. Explore the top attractions including Stanley Park, Robson Street, Granville Island, and the Capilano Suspension Bridge. Why not spend some extra time in Vancouver in conjunction with an Alaska Cruise? Alaska - Roundtrip Cruises, also known as "Inside Passage Cruises", begin and end in the same port. Almost all Alaska - Roundtrip cruises are 7-nights long and begin in either Seattle or Vancouver. Since the cruise begins and ends in the same city, it makes it very easy to extend your stay either before or after your cruise. Just modify your flight arrangements, book a hotel room, and plan your Vancouver visit. For a one day itinerary, click here. My advice is to extend your Alaska cruise vacation to include a land-based portion. Most cruisetours to Alaska are in conjunction with Northbound or Southbound cruises. Those cruisetours extend the Alaska portion of the vacation. British Columbia is another area that is worthy of extra time, so if your plans call for an Alaska - Rountrip cruise, this post should give you some ideas to start your planning. I'd be happy to help you with your plans if necessary. 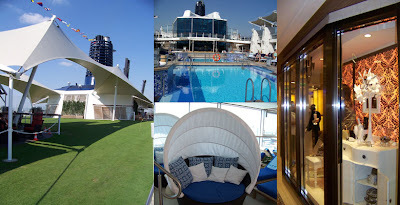 In past articles, we've talked about the various destinations that Celebrity Cruises sail to. These include Europe (featuring the Mediterranean, Scandinavia, and Russia), Alaska, Canada & New England, Bahamas, Bermuda, and the Caribbean. I think you'll agree that these are among the most sought-after cruise destinations. You've also heard about the Solstice-class ships as well as the Millennium-class ships that bring innovation and comfort to you from the moment you walk onboard and are greeted by the friendly Celebrity staff. For those that like a little smaller ship, Mercury and Century would be among your choices in the Celebrity fleet. For this month only, we have arranged additional savings onboard select Celebrity cruises to introduce you to the cruise line that is Designed for You SM. Best cabin selections are available to those that plan early, so I suggest that you review the itineraries that are featured in this month's sale and place your deposit to lock in this deal. As the Nation's Capital and surrounding areas endures another blast of winter weather, passengers scheduled to leave on Sunday's departure of Carnival Pride's 7-Night Caribbean, Baltimore R/T anxiously watch the weather and wonder if they will be able to get to the Port of Baltimore in time for their cruise. Forecasts show total accumulation of up to 2 feet of snow in some areas. Snow is expected to taper off in the evening which should allow time for snow removal. The Port Administration successfully combated a similar storm last December. The snow operations plan that worked last time will once again be implemented for this storm. The plan included round-the-clock snow removal by crews working in 12-hour shifts using heavy-duty equipment to move snow. Saturday, February 6 at 10:00 AM -- A significant winter weather event is impacting the Baltimore-Washington region on Saturday. Airlines have cancelled all flights, and indicate most Saturday service will be cancelled. Travelers are advised to check with their airlines for information regarding flight delays or cancellations. Sunday, February 7 at 11:30 AM --Snow removal operations continue at BWI Marshall Airport. Airline cancellations continue, and BWI Marshall expects limited, if any, commercial flight activity on Sunday. Travelers are advised to check with their airlines for information on flight delays or cancellations. Passengers are encouraged to rebook travel by telephone or airline website, rather than coming to Airport. Monday, February 8 at 6:00 PM --Both of BWI Marshall Airport's main runways are now open for flight operations. Airlines are gradually returning to near-normal schedules. Travelers are advised to check with their airlines to confirm flight status BEFORE heading to Airport. Passengers are encouraged to rebook travel by telephone or airline website, rather than coming to the Airport. Those customers travelling from BWI Marshall this week should consider parking under cover in one of the Airport's garages. Light rail information is available here. Winter storms like this are perfect examples of why to take Travel Protection Insurance. For example: Trip Delay / Missed Connection coverage would potentially cover any additional expenses necessary to join your cruise in progress if you aren't able to get to the departure point on time. There are several other unexpected situations that can occur after final payment. Protect your vacation investment and travel without worries. No matter what policy you chose, make sure you understand the limitations and coverages so you are not surprised after the fact. It is for this reason that I advise my customers to utilize the insurance company's help desk to get your detailed questions answered. Norwegian Cruise Line continues their Year of the Freestyle Vacation celebration with the next of the Special Bonus offers. Free upgrades available on all Europe and Transatlantic sailings. PLUS: Free Inside to Oceanview or Oceanview to Balcony upgrades also available on select sailings. AND, 50% reduced deposit. * Sailings starting from $45/Day. Find Your Cruise. Since grade school days, when you studied history, you've wondered about the lands that are across the Atlantic Ocean. Perhaps you thought that seeing these lands was outside the realm of reality. The only way you'd "see" Europe would be in books, magazines, and movies or television shows. What if you could wake up in a historic European city each day during your vacation? You would arrive in your first port of call, unpack your bags in your room and not have to repack until it was time to leave for home. Would this interest you? A European cruise vacation can turn your dreams into reality. Whether its castles, royal palaces, historic monuments, battlefields from the World Wars, or ships that were used by the Vikings that interest you, there is a cruise itinerary that will satisfy your desires. Once onboard your Norwegian Cruise Line ship you won't have to worry about transportation to the next city, meals, or evening entertainment. On a Freestyle cruise vacation, you can chose when and where to eat and what you want to do every day. When you arrive in port you can explore on your own or take part in one of the organized shore excursions. Just bring your camera to capture memories because you definitely will want to relive your vacation well after you return home. So you see, this really is the best way to see Europe. Whether you want 4 days or 21 days in Europe, there is a choice for you in the Mediterranean, Northern Europe or even on a Transatlantic voyage. Click on one of the links above to explore what NCL has to offer you in Europe.